Lussio Lisarelli from Gubbio, in Italy had a liver transplant a few years ago. He wanted to show the world what 70 year old transplant survivors could do. 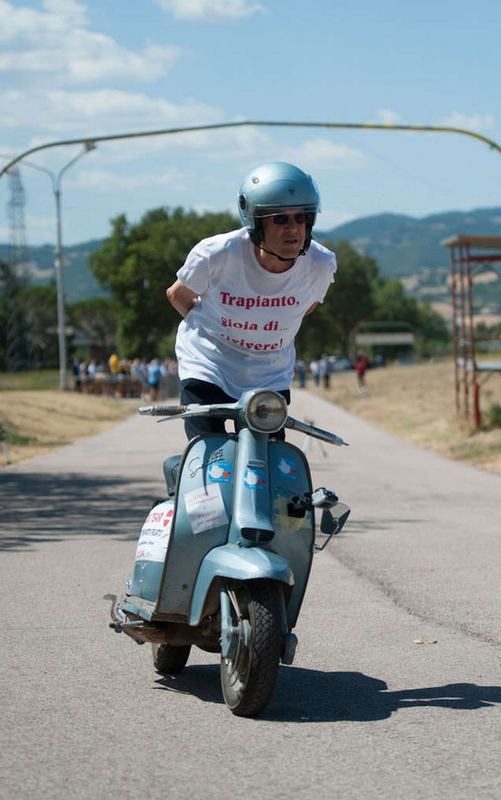 So he decided to go for the world record for riding a Lambretta, without using your hands. Like you do. Suffice it to say, he did it, travelling 1,150 metres, and exceeding 13 minutes. No handed. On a Lambretta. For the technically minded who wnat to work out how he did it I’m going to cut and paste directly from the “To lead 2 stroke” (Italian) vintage scooter blog where I found the story. This entry was posted in Lambretta Life and tagged Italy, Lambretta, World record by crocodilejock. Bookmark the permalink.